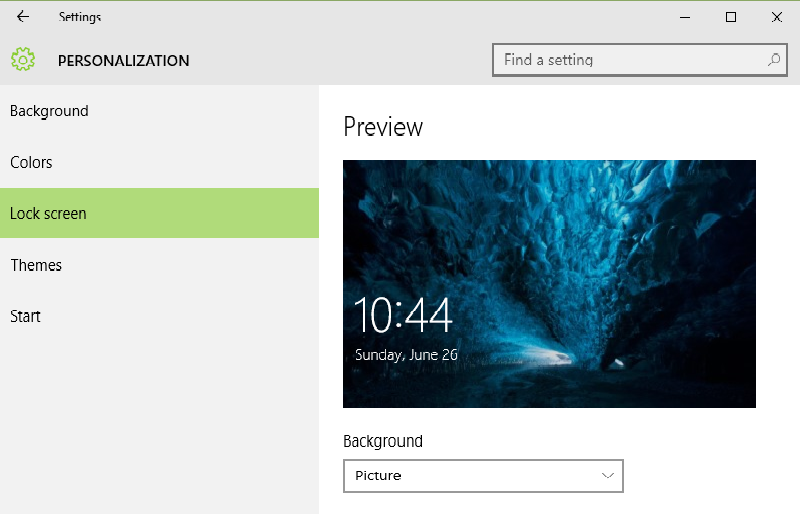 In this post, you will be shown from where you can change settings for lock screen, theme and start menu in Windows 10. For the security of your machine, you can use a password protection. Lock screen enables this feature. To change your current theme and its related settings, you can use Theme settings. Start menu settings can also set from here. 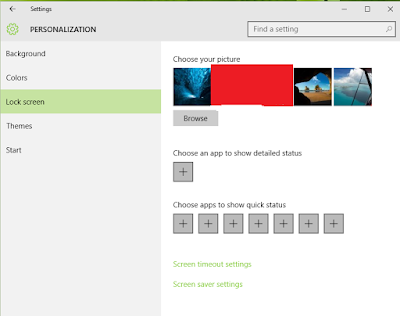 To open Lock screen, go to Start menu, click on Settings, now click on Personalization (Background, lock screen, colors). Now click on the Lock screen. Here you can see Preview of your Lock screen. Next, you can select between Picture and Slideshow in Background. If you want to keep Picture as your Background then you can choose the picture from given picture and can Browse from your computer. And if you choose Slideshow, then you can select albums for your Slideshow. You can also select pictures for your album or specify a particular folder from which you want to take pictures. Below it is Advanced Slideshow settings. In Advanced Slideshow settings, you can include Camera Roll folders from this PC and Onedrive. Only use pictures that fit my screen can be ON/OFF. Next, you can play a Slideshow when using battery power. When my PC is inactive, show lock screen instead of turning off the screen, can be set for your computer. Next, you can turn off screen after slideshow has played for, select between Don’t turn off, 30 minutes, 1 hour and 3 hours. You can choose an app to show detailed status on screen. This option can be taken with quick status. Further, you can set screen timeout settings here. Next, you can change screen saver settings from here also. 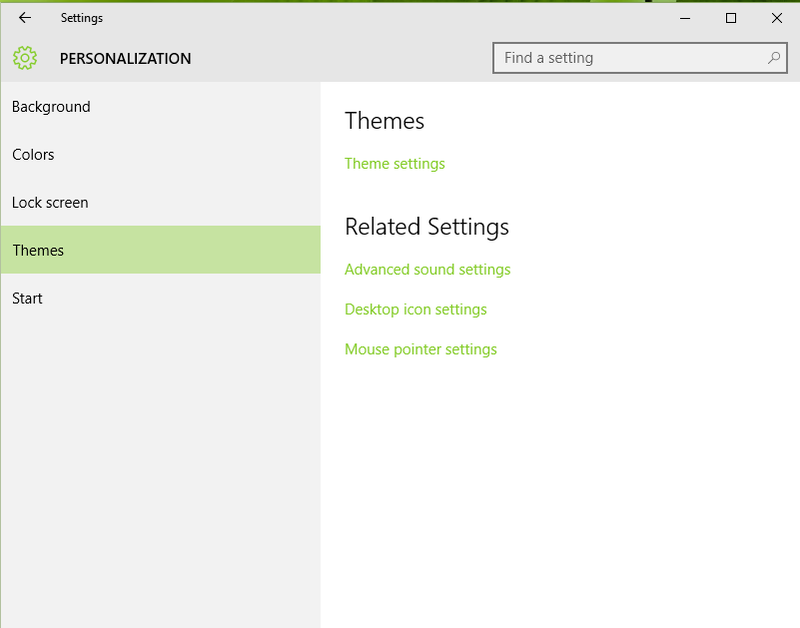 To open themes, go to Start menu, click on Settings, now click on Personalization (Background, lock screen, colors). Now click on Themes below lock screen option. 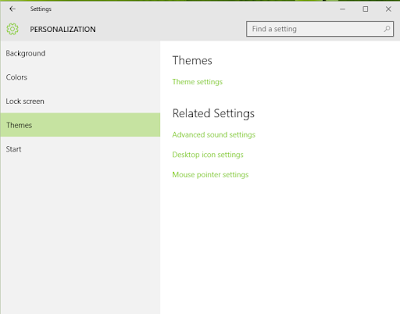 In Themes you will find Theme settings. Click on it. It will take you to Control panel. From here you can change settings of your computer themes. Here first is My theme, in here you will find two options- Save theme and Get more theme online. From Save option, you can save your current theme. You will get new themes from Get more themes online. Next is Windows Default Themes. Here you can see your default themes that come with your Operating System. Now comes Installed themes. It will show you theme installed. Further is High Contrast Themes. Here you can select from given high contrast themes. To open Start, go to Start menu, click on Settings, now click on Personalization (Background, lock screen, colors). Click on Start. In Start, you can choose whether you want to see most used the app or not. You can opt for Show recently added the app. You can use Start full screen at the time of startup. 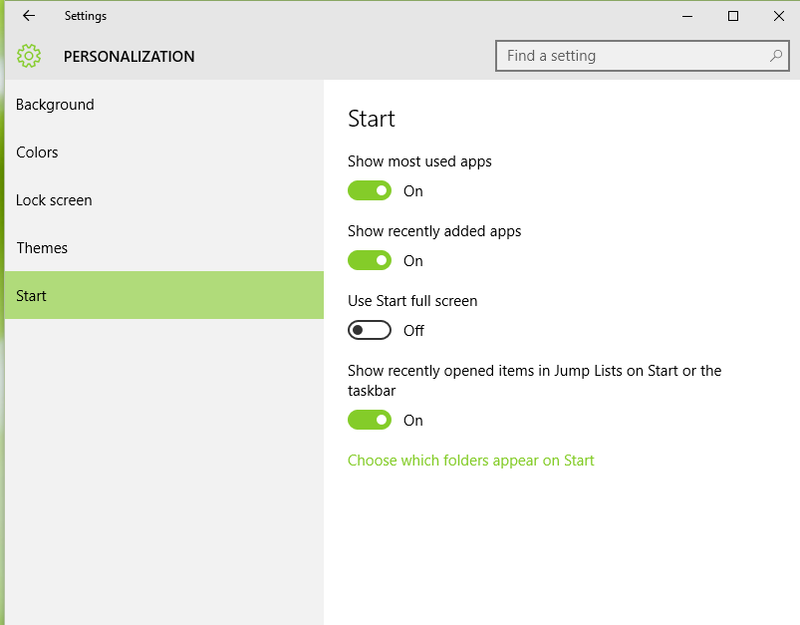 Next option will Show recently opened items in jump lists on Start or the taskbar. You can also choose which folders appear on Start. You may like New macOS Sierra from Apple has introduced with new advanced features.